The Guinness PRO14 Awards for the 2017/18 season were handed out at the Season Launch Party at The Argyle Street Arches in Glasgow tonight where 10 winners were recognised along with the line-up for the Guinness PRO14 Dream Team. With the Awards moving into the build-up of the new season this allowed voting processes that included over 75 media and the teams more time to choose their nominations across a number of award categories. Two new awards were also introduced – the Guinness PRO14 Ironman award and the Guinness PRO14 Tackle Machine award which are aimed at recognising the Championship’s key contributors. 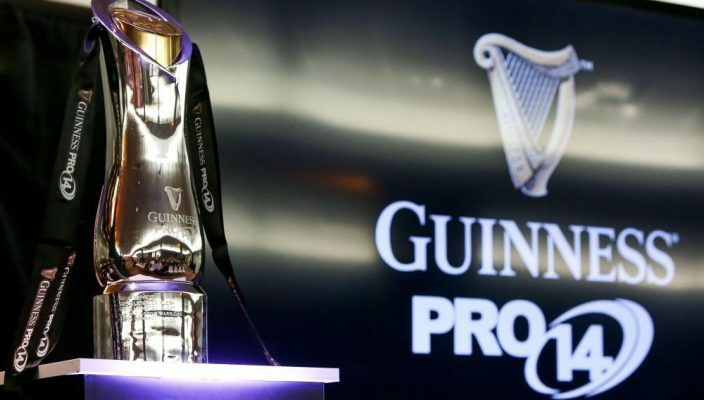 After Leinster Rugby became the first team from the Championship to complete a Guinness PRO14 and Champions Cup double, the Irish province captured three of the awards on the night. Head Coach Leo Cullen took home the Guinness PRO14 Coach of the Season award, Jordan Larmour won the Honda Young Player of the Season while Barry Daly was recognised as the Championship’s top try scorer for last season. Leinster also saw five players voted onto the Guinness PRO14 Dream Team: Andrew Porter, Scott Fardy, Jack Conan, James Lowe and Larmour. The Guinness Players’ Player of the Season was won by Tadhg Beirne for his performances in the Scarlets jersey. The Ireland international has since joined Munster Rugby but was overwhelmingly recognised by his fellow players for his displays in the Llanelli throughout Scarlets’ campaign that saw them reach the Guinness PRO14 Final. Former Dragons back-row Ed Jackson received the Guinness PRO14 Chairman’s Award in recognition of his recovery from a serious spinal injury and subsequent charity work. Jackson, 29, was forced to retire from the game last year and has since recovered to the point where he has climbed Snowdon mountain in Wales for charity. Jackson was presented his award by Gerald Davies CBE, Chairman of the Guinness PRO14, who commended him for his terrific spirit in the face of adversity. Former Toyota Cheetahs’ fly-half Fred Zeilinga won the Gilbert Golden Boot with his accuracy of 85.37% outshining all of the other place kickers (who had a minimum of 30 attempts at goal) in the Guinness PRO14 in 2017/18. Olly Robinson of the Cardiff Blues was the first winner of the Guinness PRO14 Tackle Machine Award. Players who made 200 successful tackles or more were eligible and the award was given to the player with the highest completion percentage. Robinson made a total of 243 tackles with a tackle completion rate of 94.6% (Opta). The first-ever Guinness PRO14 Ironman Award went to Giulio Bisegni of Zebre Rugby Club. The award recognises the player who accumulated the most minutes on the pitch across the 21 regular season rounds. The Italian international’s total of 1504 minutes earned him the award. entire Guinness PRO14 campaign in 2017/18. The Guinness PRO14 Dream Team was named after over 75 media (including former players and coaches) were involved in the voting. To be eligible players had to have made at least 9 appearances in the 2017/18 season. Last season’s finalists Leinster Rugby and Scarlets dominated the voting with five players each selected. Glasgow Warriors earned two representatives with back row Callum Gibbins nominated as the Dream Team captain and Nick Grigg winning a place in the midfield. Torsten van Jaarsveld (Toyota Cheetahs), John Cooney (Ulster Rugby) and Blair Kinghorn (Edinburgh Rugby) made up the final places.